Lower Manaslu Trek is one of the interesting and beautiful trek of Manaslu region, Nepal. This trek is especially for those who can not go in the high Mountain and want to see the picturesque mountains, historical places and experience ethnical communities. Lower Manaslu Trek is virgin trekking routes of Manaslu region that you will be experience of different cultural, traditional and ritual of Gurung community. The attraction of this trek is visit to the historical city “GORKHA” from where the modern Nepal is unified. Another main attraction of Lower Manaslu Trek is visit of big Gurung village of Nepal, Barpak (VC Village) and Laprak (village of Everest Summittor of Gorkha District). 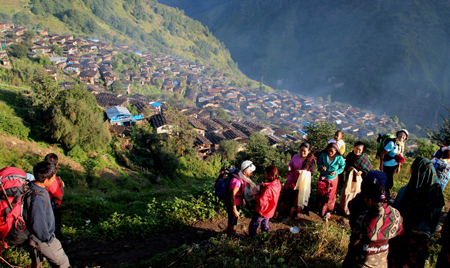 Besides this, trekkers are mostly experience of lifestyles and cultural of Gurung Community. The highest elevation of this trek is Dharache Dada of 3,200m. It is well known the best mountain view point of Gorkha District. This area is well known for densely Rohododendron forests. From Dharache dada (Hill), you will have mountain views of Boudha Himal, Sringi Himal, Ganesh Himal ranges, Langtang Himal Ranges, Annapurna ranges and many more unknow mountains. Day 03: By private Vehicle: Kathmandu to Gorkha (140km, 5hrs). Day 04: By private vehicle: Gorkha to Bhachek (1900m, 7hrs). Trek to Namki Dada 30min. Day 17: Free day in Kathmandu for self-shopping and self-visit.